A recent addition to the Azaibah cat community has decided to make use of the high quality services provided by this establishment. 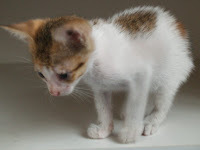 Circumstances dictated that we had to take the tiny kitten to the vet to check its condition and discuss our options as we can’t accommodate any more long-term customers. The cat is about two-and-a-half weeks old and with a bit of a clean-up, she should be fine. After antibiotics, water and a drop of baby milk, it has made a remarkable recovery and is chasing and nibbling everything. Akhi is walking around with her bottom on the ground and Koofi seems to be sulking. I reminded him that this was how he started.